The total word count on these articles is 2,364 words and includes BONUS golf graphics x 14. Some exercise routines can help you in hitting longer golf drives. A powerful swing is essential for your success in the game. You can achieve this with dynamic exercises that tone up your body. They not only strengthen your body system but also can help you in improving your grip on the game. 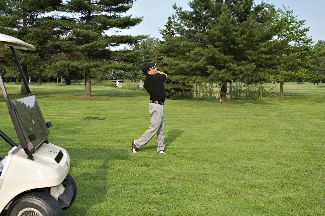 Did you know that professional golfers usually land up at the golf course 2-3 hours prior to the big game? They use this time to warm-up, practice and do physical exercises. It is essential that – like in any other game – players are properly fit in order to perform their best. What sort of exercises fit a golfer?